Background: The root canal system is complex. Eliminating the microorganisms from it is not easy. Diode laser is proposed as one of the effective methods to sterilize the canal. Aims: The aim of this work was to evaluate the diode laser parameters to be used as an adjunct for root canal sterilization to avoid any increase in temperature to prevent any thermal collateral damage to the periodontal tissue. Materials and Methods: A total of 24 single-canal premolars were used; they were divided randomly into two groups (n = 12). Group 1 was irradiated with 1.5 W continuous wave mode of diode laser and Group 2 with 2.5 W/2 5 Hz pulsed mode of the diode laser. The temperature was measured using thermometer and thermal camera at the apical part of the root. Post hoc test, Student's t-test, and paired t-test were used in the study. Results: The results showed a modest increase in temperature at the external root surface for Group 1, with maximum increase of 6.7°C in apical portion, and 8.5°C for Group 2. Conclusions: Within the present parameters, the laser is safe for use as an adjunct for root canal sterilization. The total elimination of microorganisms from infected root canals is challenging to any endodontic practitioner. In the past decades, many instrumentation modalities, irrigation regimens, and intracanal medicaments have been used to reduce the microorganisms in the root canal. Bactericidal action is mediated through direct cell contact, and chemical disinfection depends on the extent of spread of these substances into the root canal system. One of the more recent developments in endodontic treatment is the use of lasers. The properties and characteristics of laser light, and the fact that direct contact between target and fiber tip is not required, raise the possibility of utilizing laser energy to decontaminate areas deep within the dentin. All types of dental lasers are proved to be able to destroy bacteria at different power levels by photothermal interaction by destruction of cell wall and via alterations in the osmotic gradient which lead to swelling and cellular death. Gram-negative bacteria are even easier to be destroyed with minimum energy and less radiation compared to Gram-positive because of its different structural characteristics. In laser-assisted root canal treatment, the type of laser and radiation protocol can cause temperature increase at the external root surface that may have an effect on the alveolar bone., Eriksson and Albrektsson described the increase in temperature to 47°C to be unsafe for periapical structure. Accordingly, both Gutknecht et al. and Machida et al., stated that to avoid damage to bone regeneration or periodontal ligament around the tooth; the temperature of laser in root canal treatment should not overcome 7°C. The effect of laser on tooth is influenced by the wavelength, power density, irradiation mode, duration of exposure, and tissue type. The conduction of heat to the tissue surround the tooth is also affected by the presence of air or water during irradiation. The apical constriction and the narrow dentin thickness in apical region are the most hazardous to temperature elevation. The near-infrared lasers (from 810 to 1340 nm) had affinity for water and the hydroxyapatite, so it penetrates the dentinal tubules to deep thickness and is absorbed by the bacteria pigments. That's how bacteria in deeper layers are eliminated. Gutknecht et al. reported that 810 nm diode lasers irradiations for 5 s lasing followed by 5 s resting time with 3–4 W power is a better procedure to remain in safety limits of temperature. In 2010, Hmud et al. assured that the safety of using both diode lasers (980 nm, 940 nm) with 200 μm fiber to activate the irrigant inside root canal with different powers. Preethee et al. published a study to evaluate the bactericidal effect of 908 nm diode laser against Enterococcus faecalis; the results were superior compared with conventional methods. There were many comparative studies done in the recent years, especially between the manufacturers of dental laser systems. The laser uses were developed and combined with irrigants and photosensitizers to activate them. New techniques such as photo-activated disinfection and photon-induced photoacoustic streaming were updated in root canal treatment. The aim of this work was to evaluate the safest diode laser parameters to be used as an adjunct for root canal sterilization. Epic 10 diode laser of 940 nm wavelength (Biolase, CA, USA) was used with end-firing tip (200 μm dia., 14 mm length). Twenty-four intact single-canal premolars were freshly extracted for orthodontic purposes, collected, cleaned, and sectioned from cementoenamel junction to 14 mm length. The flaring of the canal was done 1 mm from the apex using nickel-titanium ProTapere manual system (Dentsply, Switzerland). All teeth were irrigated with deionized water, then stored with saline at 4°C. Samples were divided randomly into two Groups (1 and 2), each sample was labeled in Eppendorf with distilled water. Lasing time for both groups was as follows: Irradiation begins with the tip moving coronally in a helicoid motion in speed of 2 mm/s in a canal filled with distilled water. Total irradiation time for each canal was 20 s (5 s + 5 s + 5 s + 5 s = 20 s) purely without counting the resting periods, and the total working time including irradiation and resting periods for each canal = 50 s (5 s irradiation + 10 s rest + 5 s irradiation + 10 s rest + 5 s irradiation + 10 s rest + 5 s irradiation = 50 s). Group 2 (n = 12): Power = 2.5 W in pulsed mode frequency = 25 Hz and canal filled with distilled water. Each sample was fixed on a holder with ambient room temperature of (21 ± 2°C) and two K-type thermocouples fixed 2 mm from the apex (1 mm from the root canal preparation and 2 mm from the apex) to measure the temperature elevation during lasing at the point of the least dentin thickness. The other end of the thermocouples were connected to thermometer which was connected with USB cable to a computer PC that has a software (AMPROBE/USA) specialized to collect and analyze the thermometer data every 1 s. A thermal camera (Flir i5 System, Boston, USA) also used to measure the temperature changes over the root surface. 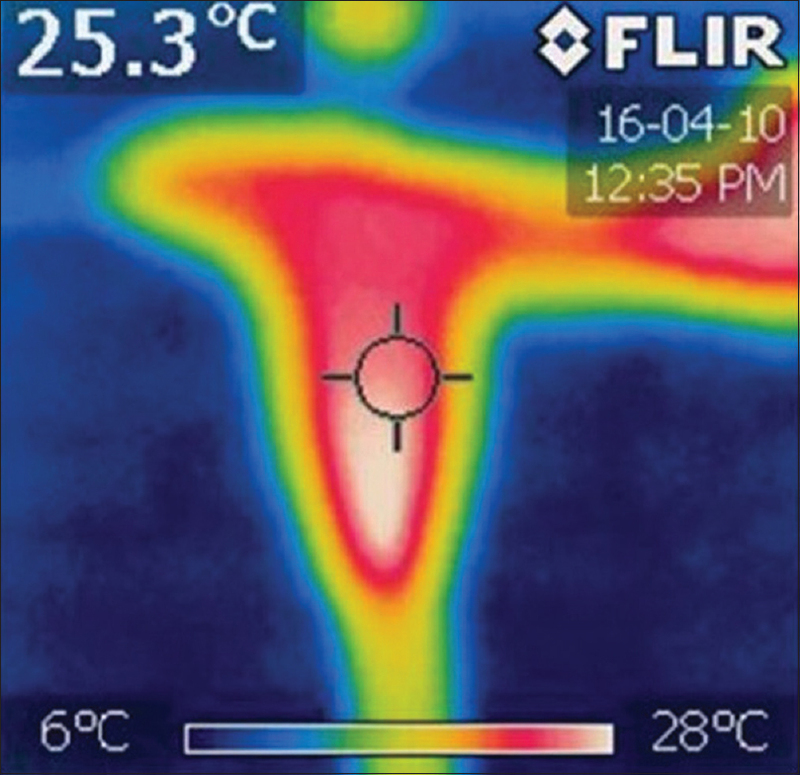 It positioned 10 cm away from sample by camera stand as recommended by manufacturer, and took thermal image during the lasing cycle as shown in [Figure 1]. The images were then transferred to PC to analyze the images with special software of the camera (FLIR Tools, Flir System Inc., USA). During the imaging, a packet of ice gel positioned 20 cm behind the sample to purify the image and prevent any surrounding thermal reflections. The setup of this experiment was arranged as shown in schematic [Figure 2]. This experiment used the same samples and lasing groups from the dry experiment for more precise comparison since the diode laser has no effect on the hard tissue and do not change its composition or remove any hard layer. The idea was to mimic the oral conditions of the tooth; therefore, the tooth surface was coated with polyalkenoate cement material that has thermal conductivity close to that of bone. The thickness of polyalkenoate cement layer ranged 0.9–1.5 mm. One thermocouple was fixed at the same point of dry experiment and it was isolated with silicon thermal paste. To assure the position of the thermocouple, an X-ray image was taken to each root. The digital water bath (WB) temperature was set to 37°C (ambient body temperature), and the other thermocouples were placed inside WB to control constant temperature. The temperature measured only on apical third where thermocouple was fixed since thermal camera does not take images underwater. The setup was arranged as shown in schematic [Figure 3]. The data of temperature measured by the thermal camera differed slightly from the readings of the thermocouple. The thermal camera results were compared with thermometer results for both groups using paired t-test as shown in [Table 1]. [Table 2] represents a full descriptive list of all the thermal results of the both thermal experiments, with minimum, maximum, and mean temperatures. 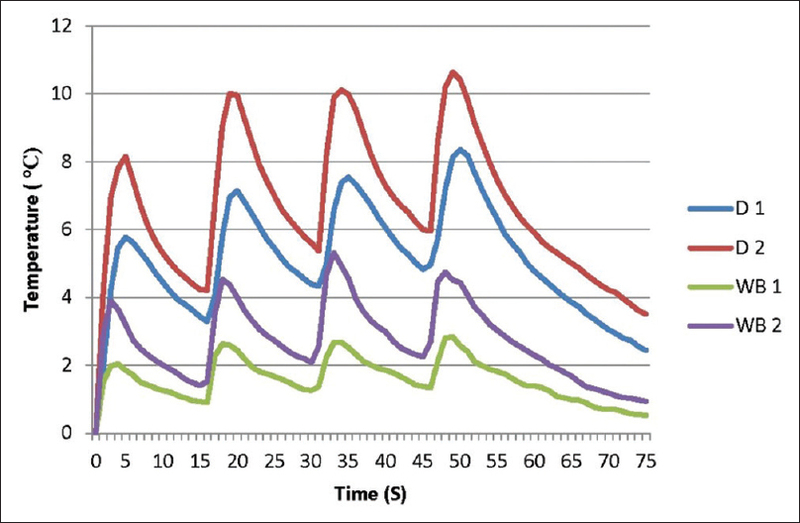 [Figure 4] showed the temperature changes behavior in relation with time of the irradiation and it appeared fluctuant due to the used protocol. The X-axis represents the total working time, whereas the Y-axis represents the temperature changes (ΔT) measured at the apical portion of the root by thermocouple. Each peak in this curve represents the pass of optical fiber close to the thermocouple which causes maximum increase in temperature. It was noticed that after the last lasing cycle, the tooth needs almost 20 s to return to its baseline temperature. Tukey post hoc test showed a significant difference between (D1 and D2) with P= 0.038, and very high significant difference between (D1 and WB1), (D1 and WB2), (D2 and WB1), and (D2 and WB2) with P < 0.001. In addition, WB1 and WB2 showed no significant difference with P= 0.073. The previous studies have shown that alveolar bone is irreversibly damaged if temperature increased 10°C above body temperature for 1 min., Our results showed that when WB is used and laser power is either (1.5) W CW or (2.5) W/20 Hz, the maximum temperature did not overcome 8.5°C with radiation duration of 20 s only. If we added to that the body effect of cooling by circulation and heat dissociation, the used powers would be very safe. The temperature results on apical portion of canal in our study came in accordance with Gutknecht et al., Alfredo et al. study, and Suchetan and Rohit. The thin dentin and the anatomical restriction in the apical portion of the root are the major concern. This study tried to focus on this part. The thermal camera images showed that even when the laser tip is on the coronal portion of the root; the heat is focused at the apical part. This is essentially due to the end-firing tip, which directs the laser beam in forward direction only. 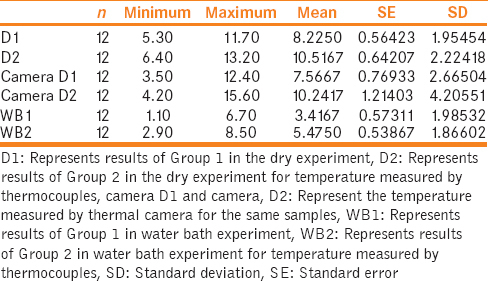 The results of the dry experiment had no significant difference in both temperature measurement methods; therefore, we can consider both thermal camera and thermometer are an effective method in evaluating the temperature on such in vitro studies. Later, in WB experiment, the polyalkenoate cement material that has thermal conductivity close to that of bone and was applied by a thickness very close to that of alveolar bone that surrounds the apical part of the root was used to as intent to mimic the in vivo conditions. The temperature rise was reduced to a very safe limit with both used laser powers tested. Hence, it was expected that even more safety in oral cavity around the tooth would occur, due to the effect of blood circulation cooling and the change in absorption. In all of the thermal experiments of this work, the canal was totally free of any blood and filled with irrigant during lasing. Because this laser is highly absorbed by hemoglobin and if blood remnants present it cause thermal damage, also the presence of irrigation in the root canal helps in laser energy distribution to gain the best results and avoid point damage in dentin walls. The parameters used in this work were the same used by Hmud et al. in 2010 which studied the cavitation effect of this laser at same power levels and same radiation duration. The water vapor is formed and collapsed, resulting in cavitation that improves the smear layer washing. The combination of irrigants solution with diode laser intensified its bactericidal action in root canal treatment  and that was confirmed by many studies that resulted a superior bactericidal efficiency of diode laser when combined with irrigants and when using diode laser alone. Furthermore, in vivo studies confirmed the higher efficacy of diode laser disinfectant capacity when used in endodontic treatments. The irrigants can also work as cooling agents after lasing as they help the root to return to its baseline temperature faster than allowing heat to dissipate passively. The same laser system is found to be effective in removing the smear layer along with NaOCl and ethylenediaminetetraacetic acid (EDTA) irrigation without significant additional loss of mineral content compared to the use of NaOCl and EDTA alone. The limitation of the study was that the thermocouples fixed only on the apical portion of the tooth, while other parts were neglected. Regarding the temperature measurements for main groups, the power of 1.5 W in CW irradiation was totally acceptable and causes no harmful elevation in temperature, while 2.5 W caused slight elevation in temperature but considered within safety limits. We should not neglect the effect of tooth supporting tissue and blood on cooling the tissue during irradiation. Jones DS, Gorman SP, McCafferty DF, Woolfson AD. The effects of three non-antibiotic, antimicrobial agents on the surface hydrophobicity of certain micro-organisms evaluated by different methods. J Appl Bacteriol 1991;71:218-27. Bergmans L, Moisiadis P, Teughels W, Van Meerbeek B, Quirynen M, Lambrechts P. Bactericidal effect of Nd: YAG laser irradiation on some endodontic pathogens ex vivo. Int Endod J 2006;39:547-57. Moritz A. Oral Laser Application. Berlin: QuintessenceVerlags-GmbH; 2006. Gutknecht N, Franzen R, Meister J, Vanweersch L, Mir M. Temperature evolution on human teeth root surface after diode laser assisted endodontic treatment. Lasers Med Sci 2005;20:99-103. Strakas D, Franzen R, Kallis A, Vanweersch L, Gutknecht N. A comparative study of temperature elevation on human teeth root surfaces during Nd: YAG laser irradiation in root canals. Lasers Med Sci 2013;28:1441-4. Eriksson AR, Albrektsson T. Temperature threshold levels for heat-induced bone tissue injury: A vital-microscopic study in the rabbit. J Prosthet Dent 1983;50:101-7. Gutknecht N, Kaiser F, Hassan A, Lampert F. Long-term clinical evaluation of endodontically treated teeth by Nd: YAG lasers. J Clin Laser Med Surg 1996;14:7-11. Machida T, Wilder-Smith P, Arrastia AM, Liaw LH, Berns MW. Root canal preparation using the second harmonic KTP: YAG laser: A thermographic and scanning electron microscopic study. J Endod 1995;21:88-91. Moritz A, Gutknecht N, Goharkhay K, Schoop U, Wernisch J, Sperr W.In vitro irradiation of infected root canals with a diode laser: Results of microbiologic, infrared spectrometric, and stain penetration examinations. Quintessence Int 1997;28:205-9. George R, Walsh LJ. Thermal effects from modified endodontic laser tips used in the apical third of root canals with erbium-doped yttrium aluminium garnet and erbium, chromium-doped yttrium scandium gallium garnet lasers. Photomed Laser Surg 2010;28:161-5. Hmud R, Kahler WA, George R, Walsh LJ. Cavitational effects in aqueous endodontic irrigants generated by near-infrared lasers. J Endod 2010;36:275-8. Olivi G. Laser use in endodontics: Evolution from direct laser irradiation to laser-activated irrigation. J Laser Dent 2013;21:58-71. Lubieniecka J, Lukasiewicz J, Joanna Bozyk J. 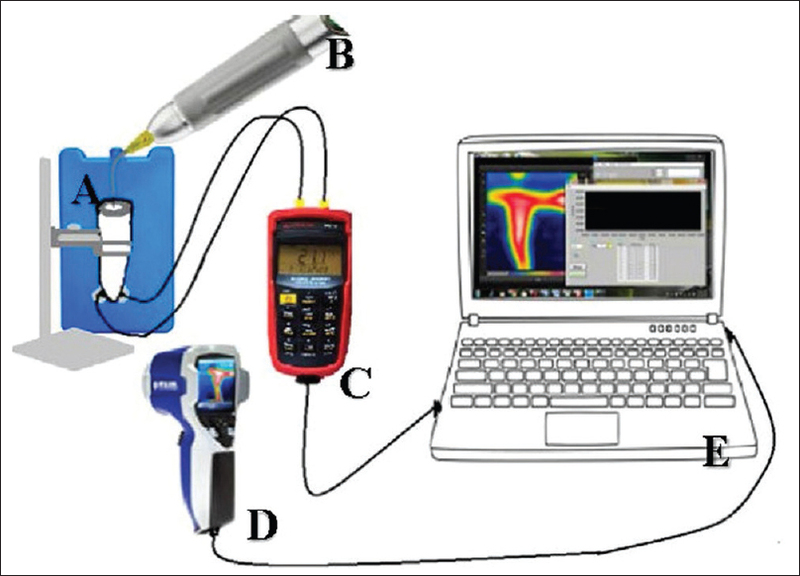 The evaluation of increase and distribution of temperature during the dental drilling using a thermal imaging camera. Appl Note Res Sci 2011;15:1-7. Inoue T, Saitoh M, Nishiyama M. Thermal properties of glass ionomer cement. J Nihon Univ Sch Dent 1993;35:252-7. Alfredo E, Marchesan MA, Sousa-Neto MD, Brugnera-Júnior A, Silva-Sousa YT. Temperature variation at the external root surface during 980-nm diode laser irradiation in the root canal. J Dent 2008;36:529-34. 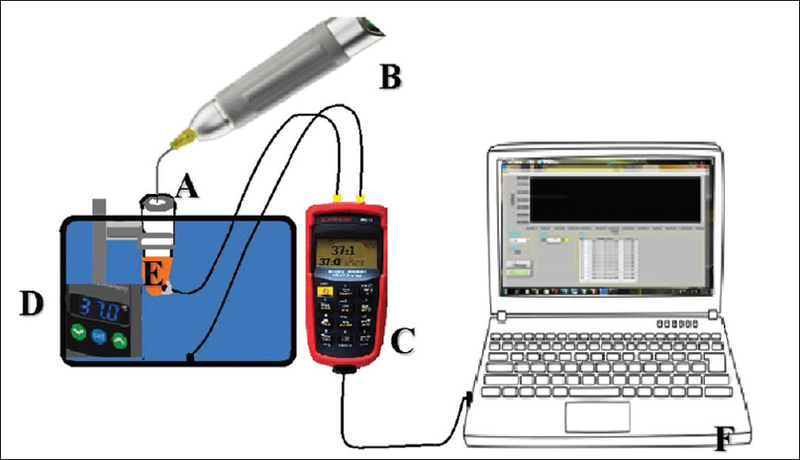 Suchetan P, Rohit K. Temperature rise on external root surface during laser endodontic therapy using 940 nm diode laser: An in vitro study. Int J Laser Dent 2011;1:29-35. Castelo-Baz P, Martín-Biedma B, Ruíz-Piñón M, Rivas-Mundiña B, Bahillo J, Seoane-Prado RR, et al. Combined sodium hypochlorite and 940 nm diode laser treatment against mature E. faecalis biofilms in-vitro. J Lasers Med Sci 2012;3:116. Moritz A, Gutknecht N, Schoop U, Goharkhay K, Doertbudak O, Sperr W. Irradiation of infected root canals with a diode laser in vivo: Results of microbiological examinations. Lasers Surg Med 1997;21:221-6. Hmud R, Kahler WA, Walsh LJ. Temperature changes accompanying near infrared diode laser endodontic treatment of wet canals. J Endod 2010;36:908-11. Saraswathi MV, Ballal NV, Padinjaral I, Bhat S. Ultra morphological changes of root canal dentin induced by 940 nm diode laser: An in-vitro study. Saudi Endod J 2012;2:131-5.